Join us Sunday, May 10, from 12 – 6pm (get your reservations in now for group of 10 or more). 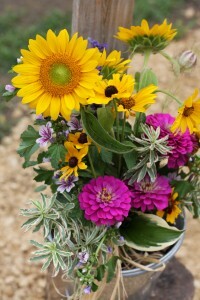 For Mom we’ve got free flowers, free chair massage, and Free Flat Pennies Ice Cream Dessert! We’ll have wagon rides through the vineyard, and entertainment by local favorites, Colleen Raye and family (Trey, Reed, and maybe Jenny), for all to enjoy! 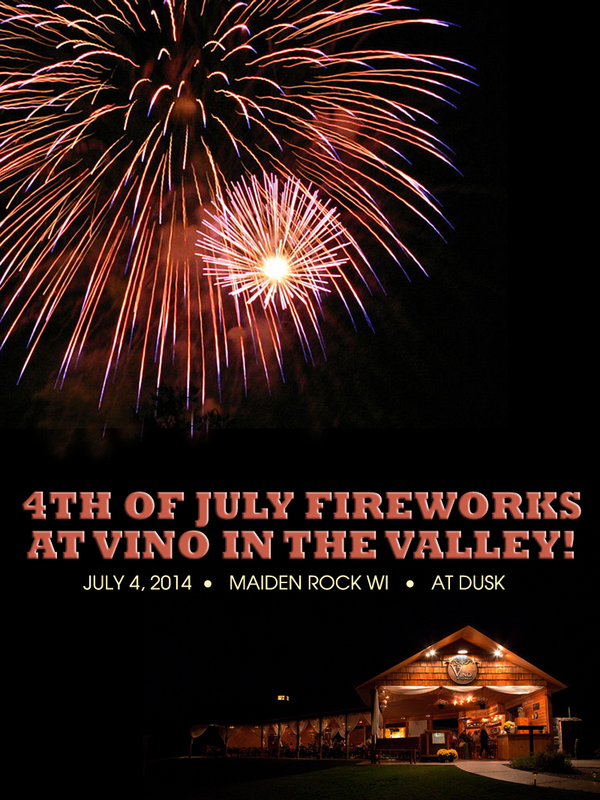 Join us this Friday, July 4, for Fireworks! We’ve extended our hours for the holiday. Bella Sera, our patio bar, will open at 1pm, with the Pavilion opening for service at 3pm. Join us for dinner. Chef Bryon has planned a special menu for the occasion: Red, White and Blue Pizza, Firecracker Shrimp Ravioli, and for the lighter appetites, a Chicken Salad Croissant Sandwich. All this in addition to our regular menu! Enjoy live entertainment on the Gazebo stage. Tim Fast could be a character right out of one of the songs he writes and sings. He’s always in search of whatever song is over the next rise, and it’s that sense of adventure that has given him a catalog of great original songs that have touched audiences at Vino and the Valley and from coast to coast. You’ll become an instant fan! Come for the fireworks. Once again, the fireworks will be conducted by Kenny and Chad Hines, who are well-known in the region for their spectacular shows. The display represents weeks of planning by Kenny and Chad, who wanted to bring you an even greater show than last year! They’ve pulled out all the stops for us, and will be bringing the latest and greatest in pyrotechnics for your viewing pleasure. The show will start at dusk so bring your lawn chairs and blankets and watch the fireworks in the vineyard while enjoying a glass of wine or beer. We’ll also be offering brick oven pizzas to go, which you are welcome to enjoy on the grounds, as well as ice cream sundaes. We hope you’ll bring the entire family! Stay up to date on the latest Vino in the Valley announcements via our Facebook page. Vino In the Valley https://vinointhevalley.com/wp-content/uploads/2018/07/Vinointhevalleylogo.png Vino In the Valley2014-06-30 21:09:022018-09-18 16:19:02Join us this Friday, July 4, for Fireworks! How many sips does it take to make it around the vineyard? That’s a good question and while we’ve never actually tried it, we’re guessing 30. Which leads us to a very special tasting event taking place at Vino in the Valley on Saturday June 1, from 4-6pm. You see, we’ve added 9 new wines and 6 new craft-style beers to the menu at Vino in the Valley this season. That’s a lot, and with such a new and expanded list of selections, it seemed logical to have an event that would allow you to sample them (and the rest of our wines and beers, too!). During the “Around Vino in the Valley in 30 Sips” event, our distributors will be on hand to offer samples (yep, you guessed it, 30 of them) of select wines and beers, make recommendations based on your tastes, and answer your questions, too. Simply purchase your tasting card at the bar ($5 gets you 10 tastings) and then head out to visit our distributors, who will have tables set up throughout the grounds. Feel free to be leisurely; there’s no hurry… Meander around the vineyard, enjoy a guided vineyard tour by tractor-drawn wagon, visit the gift-shop and farmer’s market vendors, or engage in a round of ladder golf. Bring your group of fun friends; because wine and beer tasting is serious business, you know (ha!). And plan to stay for dinner! This is one very special tasting, and you won’t want to miss it! Vino In the Valley https://vinointhevalley.com/wp-content/uploads/2018/07/Vinointhevalleylogo.png Vino In the Valley2013-05-14 20:14:402018-09-18 16:19:03How many sips does it take to make it around the vineyard?